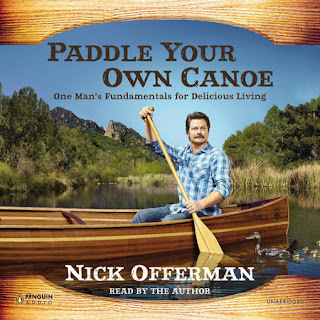 Synopsis: Paddle Your Own Canoe: One Man's Fundamentals for Delicious Living is a humorous memoir presented as a sort of self-help book as written by Nick Offerman. This review covers the Audible audiobook edition released by Penguin Audio. By the time this book was released, most folks best know Nick Offerman as Ron Swanson from the show Parks and Recreation. And Ron Swanson is quite the crazy character who feels like a serious exaggeration of a man's man with all that ruggedness and masculinity. And in this memoir, Nick Offerman plays on a lot of the stereotypes that we've come to associate with Ron Swanson and turns things on their head, so to speak. And all this just speaks to Nick's love of the theater and his interest in comedy as an art form that is more than obvious given his life and the way this book was written. So as we learn more advice from him and how to live a delicious life, we also learn more about the different circumstances and situations that helped crystalize those lessons for him. And a canoe is definitely involved. What I Liked: Nick Offerman is a very funny man and it's not easy to be funny while often playing the role of the "straight man" in comedic terms. And that is used to great effect in his acting work and in the narration of this book. And while it's easy to think that this is Ron Swanson speaking because he sounds a lot like Nick Offerman but the book really shines in the moments when we are reminded of how different they are from one another. And the stuff that he ends up sharing in this book is pretty great and paints a very clear picture of who Nick is versus who Ron is even though that's not necessarily the primary intention of the book. And as fun as it is to note the differences between them, it's also crazy amusing to listen to him talk about the many aspects they have in common such as his love of woodworking. It's a lot of fun. What Could Have Been Better: At 10+ hours, this is a long audio book and it can feel like a bit of a ramble. And that's mainly given the largely organic structure of the book as centered around his various tips for a delicious life and not necessarily based on the events of his life in strictly chronological order. And thus the recommendations just come along one after another in no particular order. At the same time I wonder if he should have just written a book as Ron Swanson (providing the network would allow it) given how much he dances that fine line between himself and the character. Or maybe this book was first structured in that manner and then he had to throw that out the window later on. Regardless, the confusion between the two can be quite real and not taking a clearer stand on either side could be a significant challenge of the book. TL;DR: Paddle Your Own Canoe is a fun exploration of Nick Offerman's life and his particular view on the world or at least an aspect of it. As much as I talk way too much about the confusion between Nick and Ron, in the end the book is just a comedic view of things that may not necessarily even represent the real Nick, which makes it all the more interesting. Thus the book gets a good 4 unusual tips for a better life out of a possible 5.